I'm inclined to think that we don't know very well what the fundamental structure of the world is. (I am, I sometimes think, like a flea on a dog's back, watching a hair grow and saying "ah, that's how the world works!") Supposing evolutionary theory is true, there would seem to be little pressure to get fundamental metaphysics right. If mainstream cosmology is correct, we've only seen a small portion of time and space in one of possibly many universes. And thoughtful people have disagreed radically about the nature of the world, even given the similar evidence base of our one small vantage point. Some say that the world is wholly material, some that the world has material and immaterial aspects, others that only minds and their contents exist and there are no material things at all. Plato thought there was a world of perfect forms behind the imperfect world we see. Panpsychists think that ordinary objects have mental lives. David Lewis believed in the real existence of alternative possible worlds. Theists typically believe in an afterlife, which must either transpire somewhere or somehow be realized without transpiring anywhere. Historically, philosophers have exhibited high confidence in various metaphysical views of this sort -- without, as far as I see, much epistemic warrant. Probably, people who lack unwarranted metaphysical self-confidence generally drop out of philosophy -- or at least avoid metaphysics or occupy the small niche of the skeptic. So metaphysics, at least metaphysics of the grand sweeping sort, tends to be written by people who lack a fully realistic assessment of their (and all of our) epistemic shortcomings in this domain. Furthermore, it's almost inevitable that a number of highly unintuitive things are true about the fundamental structure of the world. Materialism, for example, is fairly unintuitive (even if contemporary philosophical materialists find themselves able eventually to jettison their anti-materialist intuitions). But so is idealism. And so are the various forms of dualism, when their consequences are explicitly displayed (David Chalmers' 1996 book brings this fact out nicely, I think). And intuitions about the infinite, about space and time, about possibility and the openness of the future, etc., often conflict, both within and between people. It seems unlikely, then, that we have a fully coherent set of metaphysical intuitions. If so, to the extent philosophical methodology relies on metaphysical intuitions, it builds from an inconsistent groundwork, and strange results follow. BUT: Even if my pessimism is justified, I don't counsel abandoning metaphysical speculation. Rather, I advise that we give it a different role in our philosophical cognition. Rather than trying to settle on the one correct metaphysical picture, we should develop arms of a disjunction. We can improve our sense of what the metaphysical possibilities are. We can sophisticate our understanding of those possibilities and discover new possibilities we hadn't considered. We can reflect on the consequences of the different possibilities. Maybe -- although we should resist pushing too hard on this -- we can cultivate a sense of which possibilities seem relatively more likely and which seem relatively more far-fetched. Disjunctive metaphysics would mostly be an opening of the mind to the numerous (and perhaps at first wacky-seeming) possibilities, rather than a narrowing of the mind upon one. 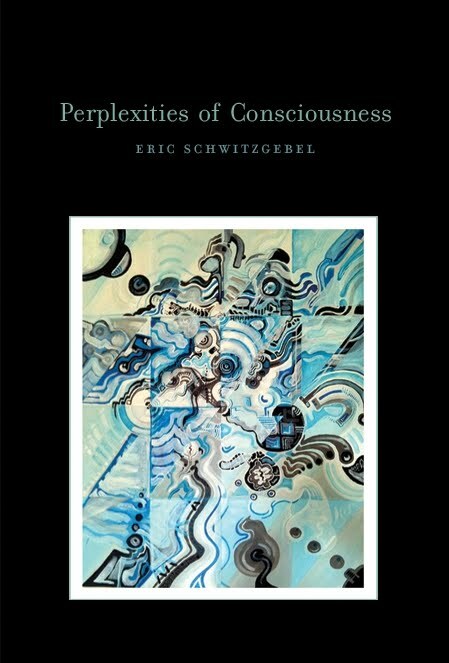 I've seen now two reviews of my 2011 book Perplexities of Consciousness. Uriah Kriegel offers one here at NDPR. And Peter Hankins offers one here at Conscious Entities. Both reviews are very generous and sensible, though naturally the reviewers articulate points of disagreement with my position. Joshua Rothman at the Boston Globe also put together this profile and interview. Amazon is quoting $18.32 for my book and Barnes & Noble is quoting $17.75 -- a good price for an academic hardback (list price is $27.95). Get while the getting's good! I didn't notice at the time, but last March the Splintered Mind crossed 500,000 visitors since its launch in April 2006. I suppose there's a five-year anniversary in there somewhere too! Thanks, everyone, for spending a little time reading some of my passing thoughts. Thanks especially to those of you who contributed some of your own in reaction. I believe that you, dear human reader, have a stream of conscious experience. There is something it is like to be you; you have (as we call it) "phenomenology". Your dog does too. Maybe even the ants in my backyard. But, I have always been inclined to think, the United States does not have phenomenology. Individual people in the U.S. do, of course, but not the country itself. It's not as though there are three hundred million individual American consciousnesses and then one additional consciousness which is the group consciousness of the U.S. But I find myself wondering: Why am I so sure of that? Let's start with a thought experiment, adapted from Ned Block. Suppose that whatever functional contribution each of your brain cells makes to your consciousness could be implemented instead by an individually conscious being -- a miniature person, suppose, inside your skull. One by one, we replace your brain cells with miniature people, and by the end we have a "you" with no brain cells but with the same cognitive-functional brain structure you had before the experiment. If we ask this being: Do you still have conscious experience? It will say "yes, of course!" If we drop a rock on its toe, it will jump around and holler. If functionalism is true, then that being will be conscious. Now let's populate your brain with miniature chairs and beds and kitchenettes for all these miniature folks. Maybe even we can expand your head to the size of a planet and connect it by remote control to the rest of your body. You should still be conscious, right? Now, let's suppose that these brain people can also engage in side-conversations with each other that don't disrupt their functionality as parts of your brain. Will they think you are conscious? Maybe not. Maybe they will say: We're implementing a complex architecture to control this body, and of course we are conscious as individuals, but the overall system is not conscious. Functionalism is probably the dominant view in philosophy of mind and consciousness studies. And it suggests (if straightforwardly developed) that those brain-people would be wrong: There's a higher-level group consciousness of which they're unaware. Block finds this absurd and thus rejects functionalism -- but we can ride the conditional the other direction. Maybe functionalism is right. Now of course we U.S. citizens are not implementing the functional architecture of a brain controlling a body. But is our situation really relevantly different? The body, for example, seems unnecessary: Most people think that a brain in a vat could be conscious. We're causally and functionally related to each other in a variety of ways. We talk to each other. We engage in group projects. We pay taxes to support the military. We vote. We pass laws and enforce them. We react to foreign threats. We trade. We explore Antarctica and the moon. Might that connectivity among us be enough to support a group consciousness? -- a real, literal group consciousness, with its own singular stream of experience, as singular and real as the stream of any biological human? Let's suppose we're liberal about biological consciousness: We think that individual ants probably have a stream of experience -- a stream very different, presumably, from human experience, reflecting the radical difference in their functional architecture. Is the United States, as a functional structure, less complex, less interconnected, less reactive to its environment, less planful than an ant? In what functional respect do we fall short? Maybe we're not tightly biologically integrated. But why should that matter? Maybe we didn't arise as a naturally selected species. But why should that matter? Maybe the boundaries of membership in the U.S. super-organism are vague. But why should that matter? Of course it's unintuitive that the United States would be conscious. But why should we think our intuitions are a good guide here? (And in any case, such intuitions might not be stable across cultures.) If one carefully follows through the consequences of any general theory of consciousness, one will find, I think, something highly unintuitive. Functionalism has some seemingly crazy consequences. But so also do all competitor theories: substance dualism, idealism, panpsychism, biological chauvinism, etc. Something that seems crazy must, I think, be true about consciousness. (I call this "crazyism".) Why not this crazy thing rather than some other? Embodiment is hot these days in philosophy of psychology. Andy Clark, Alva Noe, Rob Wilson, and others have argued that cognition and perception are not processes confined within the brain, but rather transpire in extended brain-body-environment systems. Tactile perception, the argument goes, is not a brain process in response to stimulation of the skin; rather, it is a looping process that includes as a part one's active bodily movement and environmental exploration. Thinking about Scrabble moves can happen perhaps entirely in the brain if one visually imagines shuffling the tiles; but if shuffling the wooden tiles with one's fingers serves a similar functional role, that fingered shuffling is as much a part of Scrabble cognition as is imaginary shuffling. Introspection, it might seem, is not embodied in the same way. After all, you can just close your eyes and introspect, no body involved, right? Introspection seems to be entirely interior -- a kind of attunement to one's internal stream of experiences, or the activity of the brain's self-monitoring systems. (1.) I think about what I am emotionally experiencing right now. That process involves, among other things, attending to my bodily posture and bodily sensations -- a tightness in my throat, a tingle in my cheeks, my rumpled brow. Noticing this bodily stuff contributes crucially to my introspective judgment, say, in this case the judgment that I'm feeling tense about an impending deadline. But this attention to my bodily condition or bodily experience is not merely a passive registering of that condition or experience. I actively explore my bodily condition or experience: I feel an impulse to rub my brow and to breathe deeply. This impulse is not an accidental side occurrence, disconnected from my introspective act. Rubbing my brow and breathing deeply are exploratory activities that directly contribute to the introspective result. If rubbing my brow seems to dissolve the feeling of tension up there as I continue to think about the deadline, that tilts me toward the judgment that I am not really so tense about the deadline, or at least that I am not experiencing that tension in my brow -- maybe it was just a habitual posture or remnant of an earlier but now-past emotion. If my breath catches as I rotate my shoulders back and inhale deeply, that tells me something important about my emotional-bodily condition, which informs my introspective judgment. If perception is an active, looping process that involves the body, rather than just passive reaction to stimulation of the bodily surfaces, so too is emotional introspection. (2.) I think about how broad the field of clarity is in my vision. Do I experience a broad field (say thirty degrees) of stable visual clarity all at once (as most untutored introspectors seem to think when I first ask them)? Or is does my visual experience really involve a tiny range of clarity (one or two degrees of arc) bouncing very rapidly around an indistinct background (as some cognitive scientists say)? Crucial to reaching this judgment, I think, is prying apart attention and eye movement. First, one holds one's eyes fixed on some point and attends to the visual field outside the point of fixation. Then, one starts allowing one's eyes to move around while still attending away from the points of fixation -- for example, by attending to a region and allowing one's gaze to flit around near it but not in it. Manipulation of eye gaze is, I suggest, best conceived of as part of an integrated, exploratory introspective process rather than just a bodily precondition of introspection. The core issue about embodiment is this: Where is it most natural or truest to the phenomena to draw the lines around a cognitive process? If we draw narrow, tight lines, we end up with many short processes with many fast input-output transitions. If we draw broad, inclusive lines, many of what would otherwise be inputs and outputs are reclassified as states within the cognitive process. Friends of embodiment prefer a liberal drawing of the lines and don't treat brain tissue as fundamentally different in kind from other sorts of structures that serve similar functional roles. My thought today is that the same issues arise, in much the same way, for introspective cognition as for other sorts of cognition, and that if we find embodiment arguments persuasive for perception and the like, then similar arguments probably apply to the case of introspection. What Google autofills when I type in "Schwitzgebel". Does this mean that people are more interested in my various ill-tempered diatribes against Kant than anything else I've written?